A primer on marine exhaust systems for boat builders. Marine exhaust systems are not like automotive systems. A properly designed and constructed system is vital to the efficient, smooth and safe operation of the engine, the boat, and its occupants. There are two basic types of marine exhaust systems, wet and dry. Each has variations in how they are designed. Most recreational boats use wet exhaust systems but dry systems are becoming popular again on some types of boats. The main purpose is, of course, to get rid of the hot exhaust gases. But the design of exhaust systems is also to cool the exhaust, muffle the noise and move toxic gases, such as carbon monoxide, and noxious odors away from the boat and its occupants. The design also needs to protect the interior of the boat from heat and to reduce back pressure that would keep the engine from running at maximum efficiency. It also has to be durable and safe, resistant to corrosion and corrosive gases, and not transmit noise and vibration into the boat structure. The system must prevent water outside the boat or exhaust cooling water from being ingested into the engine through the exhaust manifold. Wet exhaust systems usually consist of a water cooled exhaust manifold, a riser off the manifold that lifts the exhaust up from the manifold and then down again. The riser prevents water in the exhaust system from being ingested into the engine through the exhaust manifold. At this point the cooling water is injected into the exhaust and blown out the exhaust opening along with the hot exhaust gases. This helps to muffle and cool the exhaust. Additionally there may be a muffler in the system to quiet the engine even more. New boats after January, 2012, may also have a catalytic converter in the system to reduce exhaust emissions. Below is a typical wet exhaust riser. There are also two types of wet systems, raw water, and heat exchanger. Raw water takes water directly from the body of water you are in, picks it up and circulates it through the engine, the manifold, and out the exhaust. Heat exchangers act much like the cooling system in your car. Raw water is picked up and circulated through the heat exchanger and out through the manifold. The engine has a separate cooling system which is a closed system. Coolant; water, or a mix of water and coolant, is continuously circulated through the engine and the heat exchanger. The heat exchanger cools the coolant, much as the radiator in your car cools the engine coolant. The heat from the coolant is "exchanged" to the outside water. Raw water systems are primarily used in fresh water, and heat exchangers are primarily used in salt water. Heat exchanger systems should be flushed with fresh water from time to time to remove salt deposits. If a raw water system is used in salt water it must be flushed after every use. There are other variations on heat exchanger systems, such as keel coolers and actual radiators. Doing some research on exhaust systems will help you find the right system for the boats you are building. Dry systems may or may not have water cooled manifolds. But after the exhaust exits the manifold, no water is injected into the system. The exhaust pipe can then rise up vertically or go horizontally out of the boat. There is usually a muffler in the exhaust pipe. The pipes get very hot so usually they are wrapped with fiberglass lagging to insulate the interior of the boat from the heat and to prevent burns and fires. Dry stacks, that is, tall vertical exhaust pipes, are commonly used on larger recreational and commercial boats to direct exhaust gases as far up and away from the boat as practical. This prevents carbon monoxide and other noxious gases from getting into the boat. Dry systems are less complex than wet systems but still need to be carefully designed and installed to be as effective as possible. The US EPA has been working together with the California Air Resources Board (CARB), the USCG, NMMA and ABYC to establish reasonable exhaust emission standards for inboard and stern drive engines. Canada has similar regulations, The International Standards Organization (ISO) also has regulations for exhaust emissions. Some of these went into affect in the USA on January 1, 2012. Rather than try to show all of the variations in exhaust systems, I am going to refer you to others who have already done this. Canadian Standard TP1332 Construction Standards for Small Vessels Section 9. Professional Boatbuilder Magazine: Issue #111 and #112 (2008) Exhaust systems by Dave Gerr. West Marine Advisor https://www.westmarine.com/WestAdvisor/Exhaust-System-Basics Basics of marine exhaust. BoatDesign.Net This is just one of many threads on BoatDesign.net on exhaust systems. Use the search function to find additional discussions on this topic. 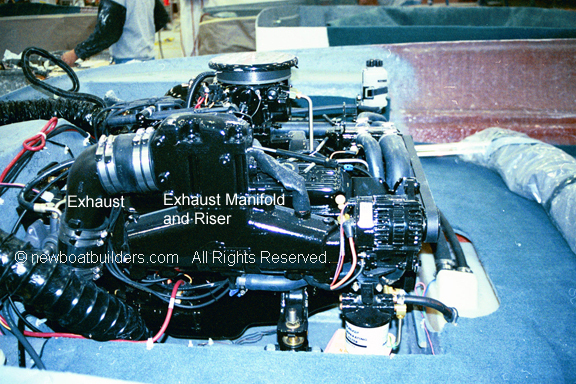 Understanding A Marine Exhaust System on Ezine Articles.